I have been working within the investigations industry for almost a decade. I have worked as a field investigator for small companies, as the owner of my own small agency, and as a regional manager for a national firm. Now, I work with small companies to help them grow their business. If it is one thing that I have learned throughout my career is this: local investigation companies crush national agencies. No questions asked. Before I go any further, a small company to me is anyone with 10 people or less. So when you hear small company – keep that in mind. Small agencies have access to the exact same resources as a national competitor. A small company may not have the monetary resources to compete against a national brand, but it doesn’t matter because $5,000 in expenses will get passed down to the client regardless of who handled the case. National companies don’t have access to different databases than local firms. LexisNexis, IRB, TLO, Tracer’s, Clear, all of them are used by national and local firms. There is no such thing as a “proprietary” system – if there was, those companies would be selling it to third party agencies. Case management systems are a dime a dozen; most firms have one for their clients. They are not anything new and offer the same service as one another. Long gone are the days where you had to wait days, even weeks, for an update. So to say that National firms have better resources, is the same as saying McDonald’s has better burgers than bob’s burger joint because they’re bigger. While it is true that national agencies have hundreds of employees working with them, most of them are contractors. Even then, doing business with an agency of 500 real full time employees does not mean that all 500 of them will be handling a case. At the very most, 4 people will be touching your file. A case manager with 25+ cases going on at the same time. A client representative to communicate between a case manager and the client. A field investigator that is being driven from point a to point z day in and out. And a background investigator trying to find online information from different sources to facilitate the investigator’s job. If one of them fails, they get replaced by another “investigator” who is going to look at this as a job instead of a career. A small agency with 5 people can easily pull the same team and go above and beyond. If they fail, they don’t eat. Often times the owner of the company will actually be working directly on your case. The lively hood of their business depends on their engagement with the client and company. Most business owners under promise and over deliver. They want your business, and they will make sure that you are a happy client to refer them more clients. Most national firms offer a service. Most small agencies offer solutions. The success of a small agency depends on how flexible and creative a company can get to solve a client’s problem. They were founded by fearless leaders and they built their team from people that share similar views and opinions. If they can’t go over it, under it, or around it – they will go through it. When there is a problem standing between them and food on their table, small agencies will find a way to get to the food. This is what makes small agency owners so passionate. They put it all on the line for themselves, and, your company is what benefits from it. National agencies started the same way, which is how they got to the point they are now. The problem with any business is that after you cross a particular number of employees, the focus goes from Solutions to Services. After they hire their 50th employee (average), they begin to worry about budgets and profits. For the most part, they look for ways to save while at the same time charge more money. This is just part of being a national conglomerate – the larger the business, the more you need to feed it – but when you have a limited number of clients, the only way to feed it more money is by raising the prices. A small company can offer the same level of service as a national counterpart even if they lack the features of a large national agency. Take bilingual investigators as an example – are they a necessity? Not really, they’re a feature, but I’ve seen several insurance companies request to have at least one bilingual investigator in the team before an agency can be added to their vendor list. Unless you are going to use a bilingual investigator 24/7, there simply is no need to request to have one on staff. If the need arises, small agency owners have the resources and network to put their clients in contact with specialized investigators. 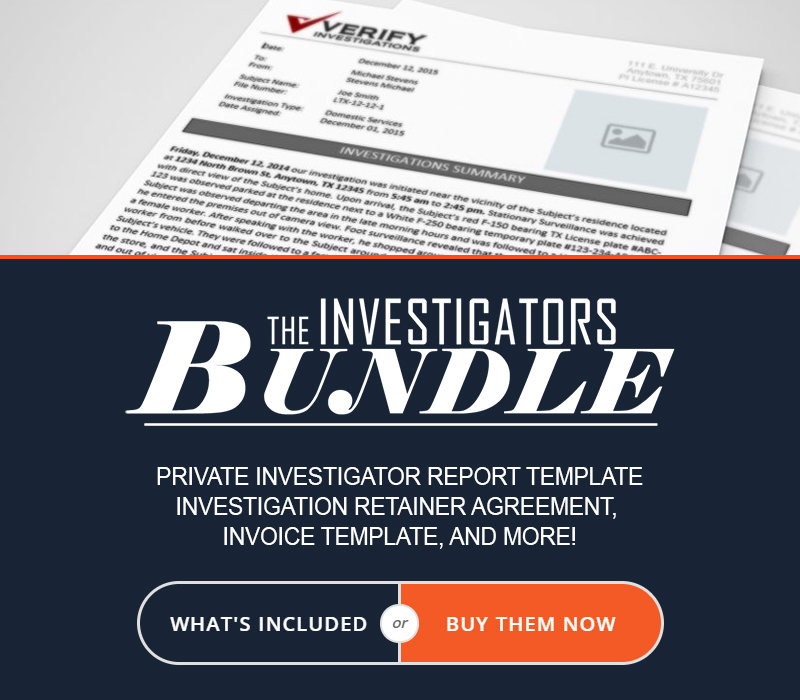 Over the last several years I have seen a pattern where investigators specialize in one particular aspect of the industry and network out their services with other small agencies. From social media investigators to surveillance specialist. If you need a private investigator with a particular specialty, contact a small agency, they’ll find you one. I’m not saying that every single national agency is bad, some agencies are amazing and still have the fire in their eyes to continue growing. But when it comes to turning over a solid and professional result, is not only imprudent, but it is right out foolish to dismiss small agencies due to their size. Some agencies will give you better results, hands down, compared to that of a national conglomerate – their business depends on it.